Hello once again fellow scrappers! Today I'll be showing how I went about doing the double lacing seen in my 'Priceless' page. I call it 'double lacing' because it uses two ribbon strands instead of just one. Besides ribbon, you can also use twine or even tulle to give it a softer look. 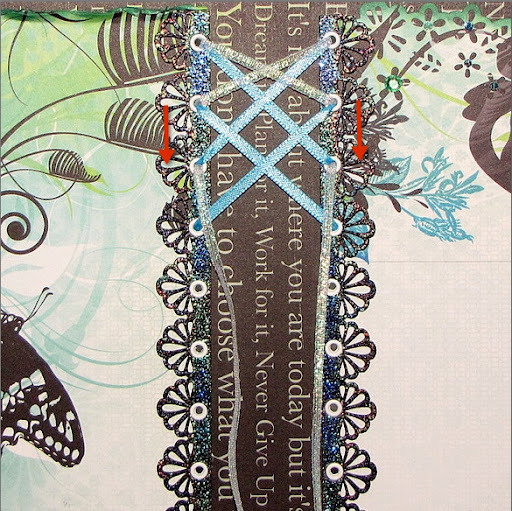 I got the lacing bug from my scrap buddy Natasha who religiously uses it on her pages. I've taken her love of lacing & have added my own small twists to it--this is one of them. Both strands can be the same color or different. I find that having strands in different colors looks better--but the choice is yours. You can also mix & match what you use for the lacing such as one strand of ribbon & one strand of twine. 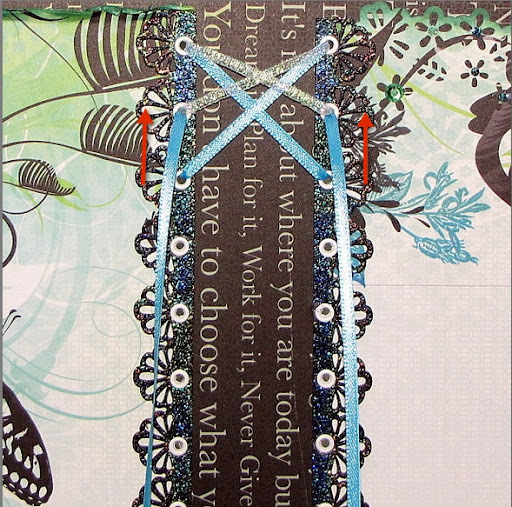 Step 1: Put both ribbon strands together & pull both ends through the first holes. Step 2: Take the ribbon that will be your predominant strand; skip one set of eyelets, cross the ends over each other & insert them into the eyelets as shown in the picture. Step 3: Take your second ribbon; do not skip any set of eyelets, cross the ends over each other & feed the ends into the eyelets directly below. Step 4: Take the ends of your predominant ribbon (which should now be behind your page) & feed the ends into the eyelets directly above. In the photo this next step is indicated by the red arrows. Step 5: At this point you're back at the beginning. Take your predominant strands, skip a set of eyelets cross the ends over each other & insert them into the eyelets as shown. Step 6: Take your second ribbon (which should still be behind your page at this point) & feed the ends out through the eyelets directly below. In the photo this next step is indicated by the red arrows. Step 7: Criss cross the ends; do not skip any eyelets & feed the ends into the eyelets directly below. Step 9: Skip one set of eyelets, cross the ends over each other & insert them into the eyelets as shown in the picture. Keep going until you're done with your lacing. Oh & one more tip before I forget...try to have an even set of holes to have a complete set of double laces. This is what the back should look like. Ensure your ribbon is not twisted--try to keep them nice & straight. Kay, you're a queen of lacing! =) Your every project with lacing is stunning!!! Thank you very, very much for this awesome tutorial. I've been wanting to get better at lacing and will definitely be bookmarking this post for future reference. Thanks again (your page is gorgeous, BTW) & have a fantastic Wednesday! Gracias por el tutorial Kay! Love this tutorial! I'm going to have to try this because it's just GORGEOUS!